Excavation within the Gothic nave of Lichfield Cathedral in 2003 revealed three phases of masonry building ante-dating the Norman period. These are likely to relate to the church of St Peter, which Bede described in 731 as housing the timber shrine to St Chad, fifth bishop of Mercia (d 672). A rectangular, timber-lined pit found on the central axis of the building might represent a crypt or burial chamber beneath the shrine. Buried in a small pit alongside this were three fragments of a bas-relief panel of Ancaster limestone, carved with the figure of an angel. They comprise half of the left-hand end of a hollow, box-like structure that had a low-coped lid. This is interpreted as a shrine chest associated with the cult of St Chad. The sculpture, which was broken and buried in, or before, the tenth century, is in remarkably fresh condition, allowing for an in-depth analysis of its original painted embellishment and for an assessment of the monument in terms of its iconography and stylistic affinities, and thus the possible conditions of its production. Sabian: 14º Capricorn: An ancient bas-relief carved in granite . Kozminsky: 14º Capricorn: A woman in a drapery establishment, the table crowded with articles of dress, none of which please her. 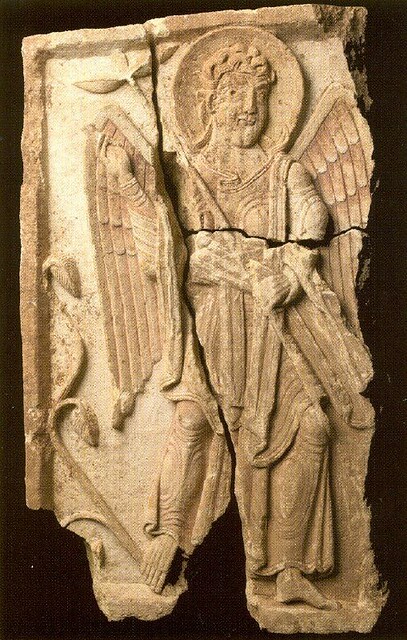 Lichfield Angel is a limestone sculptured panel, from the 8th century, which was recently discovered in Lichfield Cathedral. It depicts the Archangel Gabriel and still bears the remnants of Saxon paint. The proud kingdom of Mercia is expanding its power and lands. Its armies are fighting bloody wars with neighbouring kingdoms – Northumbria to the north, East Anglia to the east and Wessex to the south. Superbly armed warriors fight and die on blood splattered battlefields. It fascinates me that one of the world’s best-kept secrets is how cinemas have become our new covert cathedrals. I believe cinema is now the most powerful secular religion, and people gather in cinemas to experience things collectively, the way they once did in church. Aries 20: A blacksmith hammering a piece of red-hot iron on an anvil. Everyone knows about the Sabian Symbols, but only a few have knowledge of Kozminsky’s set of symbolic images associated to the 360 degrees of the zodiac. Isidore Israel Kozminsky was born on 25th October 1870 into a Prussian Jewish family who had emigrated to Australia via London a few years before his birth. Kozminsky was a well-known Jewish occult and esoteric author, reputed to have been a leading member of the Hermetic Order of the Golden Dawn. His works reveal a very broad knowledge of esoteric tradition and astrological knowledge. During his life Kozminsky wrote several valuable books on astrology and numerology. In 1917 he published his work on the zodiac degrees in a book named ‘Zodiacal Symbology and its Planetary Power’; which is an invaluable tool for interpreting natal charts in greater depth. In this book, Kozminsky describes each degree of the zodiac in terms of its planetary vibration, symbol and interpretation. When ascendant, midheaven or planet has additional minutes of arc, he recommends that the interpretation for the next degree be applied; hence 17Leo14 is classed as 18 degrees Leo. Kozminsky, along with his wife and two children moved from Australia to London around 1935, presumably because London had established itself as the centre of esoteric and occult tradition by that time and though Kozminsky had a doctorate in archaeology and owned a well established jewelry business it was esoteric tradition that became his lifelong passion. He died in London in 1940 aged 70. Having survived two war time bombings he was knocked down an escalator on the London underground and sadly never recovered. His vast writings and deep understanding of esoteric tradition are his lasting legacy. One of the dangers inherent in sorting through hoards of paper with words and pictures on them, is the siren call to stop and read , slowing down the whole collating into new cachelets process ~ which is probably what happened back in 1995. (I dunno, I’m taking a wild guess here). In 1995, when I was 34, I do know I was looking at the pages and images I had pulled out of magazines in the genre of Better Homes & Gardens, Home Beautiful, Your Garden and then there were the recipes. I’d been pulling them since 1973 from the Family Circle, along with umpteen hundreds of craft articles. Somewhere in here there is an intersection between OCD and a shamanic process of dreaming a future life into being. Visionhoarding before vision boards became the flavour-du-jour in the New Age Candy Store. That’s my word in this context. If you use it, say you found it here or else I’ll send my squirrel. His name is Vito. This early vision, a real Martyr Stewart deal, revolved around: Husband. House. Garden. But I digress………..
George, if you are not a fan, was born in Chinchilla, Queensland to Greek parents. A chinchilla is another of nature’s cute little fuzzybutts; a crepuscular rodent, which sounds like something ya should put cream on, ya know…..
Anyways, George’s parents were from Kythera and it was between the island of Kythera and Crete, that in 1900 the Antikythera Mechanism was found by sponge-divers. Now, you would think that Georgie would have a lightbulb moment and make a movie about this crustaceous lump of antiquity, but no………he’s planning on making a futuristic version of the Odyssey with Brad Pitt. Maybe I’ll have to write the book so George can pay me squillions for the film-rights. 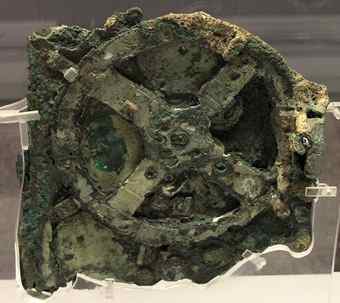 ~ Professor Michael Edmunds, upon the most recent study of the Antikythera Mechanism. ...so...where'd ya hide the Bodhi nuts? 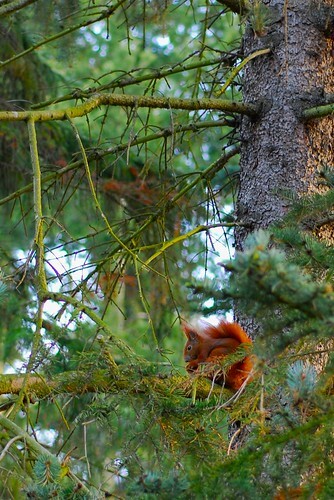 Here be squirrels. Hold onto your nuts! You are currently browsing the The Violet Hour blog archives for March, 2011.